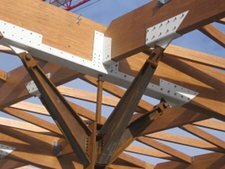 In mid 2010, Portland Bolt provided 14,000 lbs of galvanized hex bolts, lag bolts, threaded rods and shear plates for the wood truss structures in the Portland International Jetport Expansion Project in Portland, Maine. The airport expansion would roughly double the size of the airport creating expanded road access, double the amount of security screening points, and create three new passenger gates. Starting in the mid 1990’s, travel has been steadily increasing due to the rise of smaller, low-cost airlines providing increased services to smaller airports. The $75 million dollar project was deemed necessary to keep up with the increased traffic that has grown to 1.8 million people passing through the jetport annually. The project will not only create an additional 137,000 square feet of space, but will also make huge efficiency improvements on baggage handling and energy consumption. When the project is completed in 2012 it will allow for more flights and increased tourism dollars from travelers. Portland Bolt’s ability to custom make threaded rods and hot-dip galvanize them though our own galvanizing line ensured the delivery and quality required.